Starting the year off with ideas on the best ways to use technology to support learning, Larry Ferlazzo collected an invaluable list of criteria last year from educators, to which he added more resources in his recent blog post for EdWeek.Other posts in the series include Using Ed Tech to Create Deep and Meaningful Experiences and Effective Ways of Using Tech in the Classroom. Here is MindShift's contribution to the collection of ideas. 1. GAMES AND GROUP WORK. For those wondering what a game-based classroom looks like in a traditional school, take a peek into Ananth Pai's third-grade class in Parkview/Center Point Elementary school in Maplewood, Minnesota. Using his own money and grants that he applied for, Pai has managed to round up seven laptops, two desktops 11 Nintendo DS's, 18 games for math, reading, vocabulary, geography, and 21 digital voice recorders. Students' reading and math scores went from below average for third grade to mid-fourth-grade level. Students compete in games with other kids across the world, learn about fractions and decimals by riding a virtual ghost train, for instance, work on their reading skills on sites like Razkids, figure out whether they can make a living by growing flowers, learn about their constitutional rights with the Go to Court Game, and so on. Teacher Kevin Ballestrini turned his introductory Latin class at Connecticut's Norwich Free Academy into an alternate reality with an online video game. The students' job: to save the world by joining a shadowy organization on a quest to find the Lapis Saeculōrum that was part of an Ancient Roman society. "It's a mix of a role-playing game and an alternate reality game," Ballestrini says. Students play the role of Romans in a reconstruction of ancient Pompeii (or ancient Rome) and have to learn to think, act, create and write like a Roman in order to win the game. And those are the same goals of any introductory Latin course. In Ramsey Musallam's A.P. Chemistry class at Sacred Heart Cathedral Preparatory in San Francisco, cell phones are a natural extension of the way he communicates with his students. As soon as kids walk in, Musallam sends out a text blast through Remind101, asking them a challenge question that's related to the day's lesson. "First person to tell me the units on K for a second order reaction gets chocolate," he types and sends off. His students know he does this regularly, so they're constantly anticipating the question during the day, in and out of class. "Sure, that's kind of cute," he says, admitting that it can be seen as gimmicky. "But more importantly, in my mind that's saying, 'You're carrying around something that I can contact you with.' It's a fun ways to stay motivated in our day, which can be pretty dry sometimes. 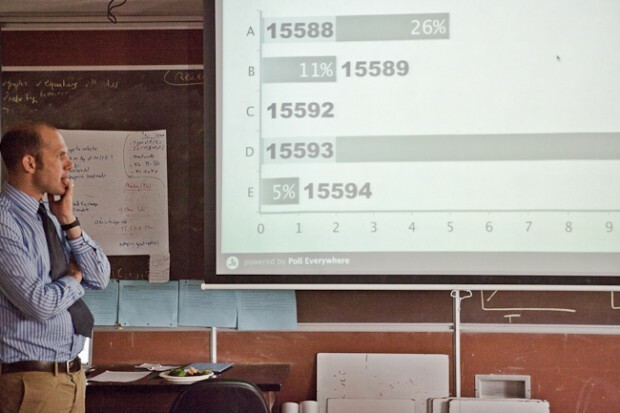 It's a chance to think about what we're learning outside the context of state testing." The online game Minecraft allows players to build their own digital world, brick by digital brick. Players must scavenge for resources to build things -- mining for stone to build buildings, mining for coal to build fire. Teachers like to use Minecraft because it's a "sandbox" game -- it provides players nearly limitless freedom to build within it. As a player's skill develops, the game's complexity increases. Players can collaborate on building complex structures, use programming features to build contraptions, games, or compose music. Earlier this year, two teachers, Santeri Koivisto and Joel Levin, decided to make the online game Minecraft more accessible and to teachers and their classrooms. They joined forces to found MinecraftEdu, which now offers a plug-in that enables teachers to tailor the software to individual curriculum.